Premium Korean scrub soap with natural AHA and red ginseng. Its excellent scrubbing effect of natural walnut shells helps the peeling care while the combination of 22 oriental herbal extracts will provide skins with effects of nourishing and hydrating to keep them healthy and moist. Minute particles grinded from natural walnut shells work without irritation on skins to remove old horny shells and bodily waste as well as to massage skins softly more than ever. Interactions of Korea red ginseng extracts and oriental herb extracts make skins greasy and moist. Natural AHA constituents make the entirely distinguished level of dirt scrubber soap. *AHA (fruit extracts): Abundant vitamin C in the mixed fruits extracts from grape, orange, apple, lemon, lime and others works to soften the skins removing smoothly old horny shells and dirt. Use of this product not only for bathing but also for shower. 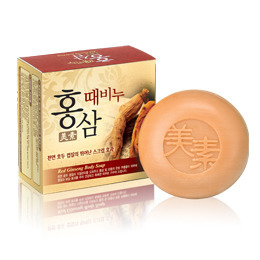 This Red Ginseng soap will allow you to scrubbing away greasy skin. Three solutions/Peeling care + Nourishing care + Hydrating care at one time. Grainy skins would turn to be greasy. Antacid effects of Korea red ginseng extracts containing abundant saponin, in combination with nourishment from oriental herb extracts consisting of 22 kinds; such as lonicer flower, paeonia japonica, Baikal Skullcap, membranous milkvetch, cnidium officianle etc. will refresh the worn skins back to healthy and vigorous ones. 1. Soak the body completely with hot water. 2. Froth Red Ginseng Soap to brush over the body evenly. 3. Wait about 5~10 minutes. (Pass the time nicely by doing massage, tooth brushing, shampoo or cleaning bathroom.) 4. Rinse the froth out of the body thoroughly with clean water and scrub softly with dirt-scrubber.